Want to charge your AirPods case while waiting for your flight at the airport or while traveling on a bus to your office? Not able to find a power outlet in your surroundings? Go wireless and avoid situations as such that hampers you from using your wireless earphones. People are gradually embracing wireless charging, and you too should consider it. Get the best AirPods wireless charging cases from the market and free yourself from those clutters of wires. How Wireless Charging Cases for Apple AirPods work? Due to in-built Qi wireless charging receiver, these cases can work with Qi-enabled wireless chargers and hence can function as Qi wireless charging case for AirPod. What you require doing is place your Airpods charging case on a wireless charging pad, and it will automatically start powering it up. Further, these cases are equipped with an intelligent chip that keeps your AirPods safe against from accidental short circuits, overcharging or overheating issues. Read on to explore different wireless charging cases for AirPods. Also, don’t miss to check out our list of the best AirPods cases and best AirPods charging stands. You can now enjoy charging your Apple AirPods wireless with the wireless charging case from FOINEXX. Keep your AirPods in the charging case and place the case on a Qi wireless charging pad. Your AirPods are ready to charge now. A UV coating on this case offers ample amount of properties like glare reduction, scratch resistance, anti-fogging, chemical resistance, and microbial resistance that prevents your AirPods from damage. Charges AirPods fully in 1.3 hours. Tightly fits the AirPod and hence can be carried conveniently. This wireless charging receiver from Skywin is designed from the supremely high quality of glossy plastic. Hence, it ensures that the plastic neither break nor soil even after everyday wear and tear use. You can easily install and remove it, unlike other charging cases. It is efficient to charge your AirPod fully in just 1.5 hours. The LED light indicator notifies you when it is completely charged. Moreover, it works with any Qi wireless charging pad. MFi certified electronic connector that connects specifically to Apple devices. Convenient to carry wherever you go. The Qi wireless case from PowerPod features a simple yet elegant design that perfectly complements the form factor of your AirPods. You can flaunt it with style wherever you go without any fear of losing your AirPods when they are placed in this case. Manufactured from high-quality silicone, this charging case offers a great feel when held in hand and also ensures protection to your AirPods. It snugly fits your AirPod case. Furthermore, silicone acts as an insulator between the charging coil and the AirPod case to keep them safe and sound. Works with any Qi wireless charging pad. You can now add wireless charging functionality to your Apple AirPods with the wireless charging case from Funxim. You can also use this case as a protective cover for your AirPods and keep them free from scratches, dust, and dirt. Its smooth exterior offers you a firm grip while you hold it in your hand. Integrated with an advanced chipset, this cover ensures the safety of your device against overvoltage, high temperatures, and overcurrent. Hard shell protection against scratches and bumps. Available in four colors – Blue, Green, White, and Red. Willing to add wireless charging to your existing AirPod case? Buy Qi wireless charging case from NeotrixQI and augment wireless charging functionality in your old case. It perfectly wraps around your AirPod case and offers fast charging. It is developed using ABS in order to deliver a compact size and hard protective cover for your device. It safeguards your charging case from scratches and also keeps it free from scuffs. Thus, your charging case always appears like a newly bought one. Built-in smart chip for effective charging speed. Smart Qi wireless charging chip to prevent your AirPod from electrical hazards. 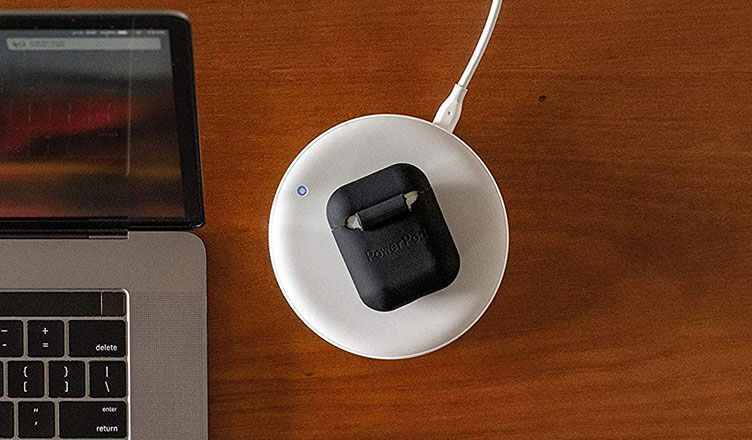 Bring home the Qi wireless charging cover from Drift and say goodbye to the messy cables. It is exclusively designed to fit your AirPods and juice them wirelessly. Just place your AirPods in the case and then both of them on a charging pad. Your Airpods are ready to get charged. Featuring a built-in US TX Ti smart chip, this case is capable of controlling the circuits and making them work efficiently. It causes them to deliver quick and fast charging. Moreover, the case is manufactured from materials like PC that avoids scratches and scuffs to nest on your device. Multi-charging protection – over voltage, over output, over current, high temperature, short circuit. Uervoton offers you Qi wireless charging mat that frees you from the troubles of plugging your AirPod charging case into a power outlet. You can roll this mat and slide it in your pocket to carry it along with you wherever you go. You can pull it out when AirPod requires charging; drop them on the mat whether on your desk or on a table, and it charges them. Designed to be impact resistant and scratchproof, this rugged polycarbonate wireless charging mat defends your Apple AirPod as well as its charging case from everyday wear and tear use. Furthermore, its MutliProtect technology safeguards your device from unexpected surges and more. Made from ABS and PC materials, this Qi AirPods case from MoKo is sturdy and durable. It is tough to withstand scratches, dust, and external shocks to protect your AirPods. Its charging indicator notifies you about the charging status of the AirPod. It is light in weight and portable in design. Hence, you can easily carry it around. It perfectly fits your AirPod and its original charging case. This wireless charging cover won’t hinder any data transmission function of your AirPod. In-built highly efficient Qi chipset for secure charging. All round protection to your AirPods from scratches, scuffs, and shocks. The wireless charging case for AirPods from Leakind is compatible with any Qi wireless chargers. It is designed to protect your AirPods from dust, dirt, cracks, and scratches. With your AirPods in this case, you can roam worry-free. It is entirely compatible with your AirPods and its existing case. The pairing button remains accessible. Thus, you can pair AirPod with your smartphone or tablet while they still stay in the case. Closed design keeps your device safe. Full access to the pairing button. This protective cover with wireless charging for Apple AirPods from SingDeRing frees you from the hassles you using a cable to charge. Just place your AirPod with charging case on a Qi wireless charging pad, and you are all set to go. Equipped with a smart charging chip, it charges your device effectively and efficiently. Its smooth surface offers you the feel same as that of your AirPod when you hold it in your hands. In addition to this, it is also designed with a view to protecting your AirPods from unwanted scratches and dirt. Which among the above listed best AirPods Wireless Charging Cases would you like to purchase? Do share your views with us in the Comments section.